Edmonton has transitioned into fall with the brisk mornings and orange leaves scattered about. When the cool weather comes I crave foods that warm me up. Soups, stews, and anything that falls under the comfort food category works for me! 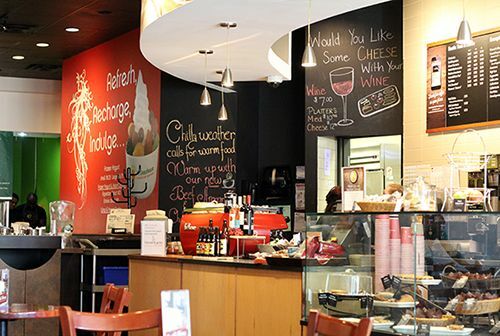 Good Earth Coffeehouse is a Calgary-based coffeehouse franchise with 40+ locations across Canada. Back in my university days, Good Earth was a spot I visited from time to time to catch up with friends over coffee and pastries. There's a comfortable, casual vibe and it's a great spot on campus to sit down and get some work done. During my undergrad, I never quite ventured into their savoury dishes, but I recently heard about their fall menu and stopped by with my boyfriend to check it out. With soups and stews to warm up, I couldn't say no. After all, it's what I've been craving lately! As described by Good Earth, the fall menu features dishes with classic flavours and some uncommon touches. New on the fall menu this year is a Chicken Pot Pie ($4.75 sm/$6.75 lg), served deconstructed with two pieces of herbed pastry on top. 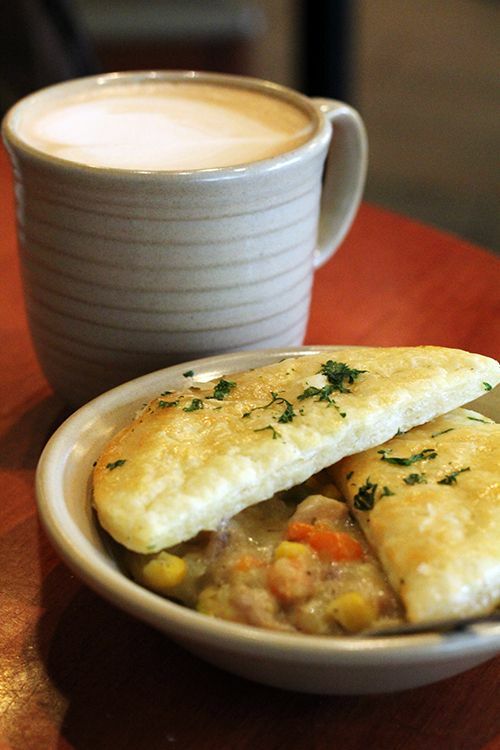 Chicken pot pie is a comfort food classic and Good Earth's version hit the spot. A generous portion of chicken and vegetables sat in a well-seasoned gravy sauce. Combined with the flaky pastry, this was hearty dish to warm up with. Next we tried the two flatbreads available on the menu. The Kale Pesto Flatbread ($5.25) is topped with a kale and basil pesto, roasted asparagus, heirloom tomatoes and feta. The Sicilian Flatbread ($5.25) features three types of Italian salami, roasted red peppers and olives. While the Sicilian Flatbread had great flavour reminiscent of those in a pizza, I was partial to the kale pesto version given the contrasting textures and vibrancy of colour and flavour. The flatbreads were paired with a Pumpkin Spice Latte ($4.75 med), which had just a hint of pumpkin spice. The spices were not overwhelming and the latte not too sweet, which is what this fall-themed drink should be! To finish off the visit we enjoyed a Pumpkin Spice Muffin ($2.25) paired with a Vanilla Rooibos Latte ($4.10 med). 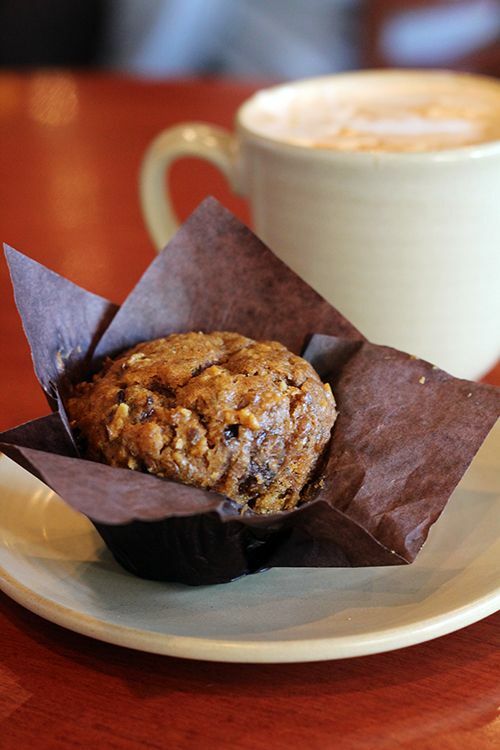 The pumpkin spice muffin at Good Earth is vegan-friendly and the most popular muffin at the cafe year after year. I can see why - the muffin is incredibly moist, not too sweet, and chock full of dried fruit and seeds. The muffin is filling and pairs well with the fragrant vanilla scented tea latte. Sitting down at Good Earth for a quick lunch brought a bit of nostalgia, but I'm in no rush to resume any post-secondary education any time soon! Regardless, it was great to take in the surroundings and enjoy some of the new items on the Fall Menu. I love that Good Earth is affordable and a great option around the city for coffee and a quick, hearty meal. Stop by to grab a muffin and a latte, or sit and have a bite to eat. The Fall Menu is available for a limited time, and as we all know, pumpkin spice will be gone in a flash! 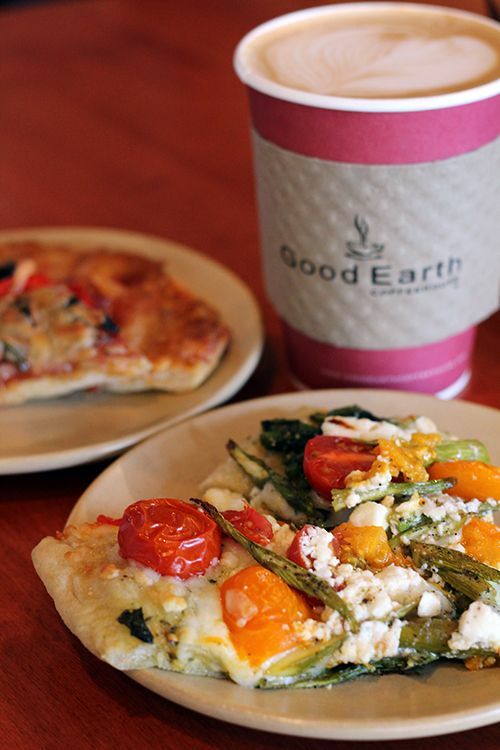 *Disclosure: I was invited to try the Fall Menu at Good Earth Coffeehouse. Views expressed in this post are solely mine. This post is 100% my opinion, and as always, my priority is to you, the reader, to present an unbiased, thorough review. Imagine having to prepare the food for an event hosting hundreds of guests. How many people would it take? What would you serve? How much food would you need to make? Those are the types of questions that Chef Simon Smotkowicz has to think about on a daily basis as the Executive Chef at the Shaw Conference Centre. There is no doubt that the Shaw Conference Centre is the city's largest venue, and plays host to everything from conferences and conventions, to parties and festivals. The list goes on, and the Shaw Conference Centre can literally transform the halls into any venue you desire. With big events come big crowds to feed, so Chef Simon works alongside a talented group of individuals on his team. Two weeks ago I had the opportunity to go behind the scenes to check out the kitchen at the Shaw Conference Centre and honestly, I can't believe that a kitchen that size creates thousands of plated meals! The Shaw Conference Centre is moving towards utilizing as much fresh local produce as possible in their cooking. Since they put the money into acquiring quality ingredients, all the produce is treated right and processed by hand. That means every single vegetable on your plate is hand chopped and prepared. Just imagine how many people would be needed for prep work alone! The kitchens have also moved towards baking their pastries and bread in house (with the exception of white sandwich bread), which means those dinner rolls with your meal are baked fresh the day of the event. Following the kitchen tour we were given an introduction to the new East Indian Menu, and sampled over 30 of the dishes available on the menu. While I do eat Indian dishes from time to time, I am in no way an expert on the names and origins of the dishes. Thank goodness for Chef Lalit who gave us all a run down of each dish - after all, he was in charge of menu development, and you could really tell he poured his heart and soul into the creation of the menu. 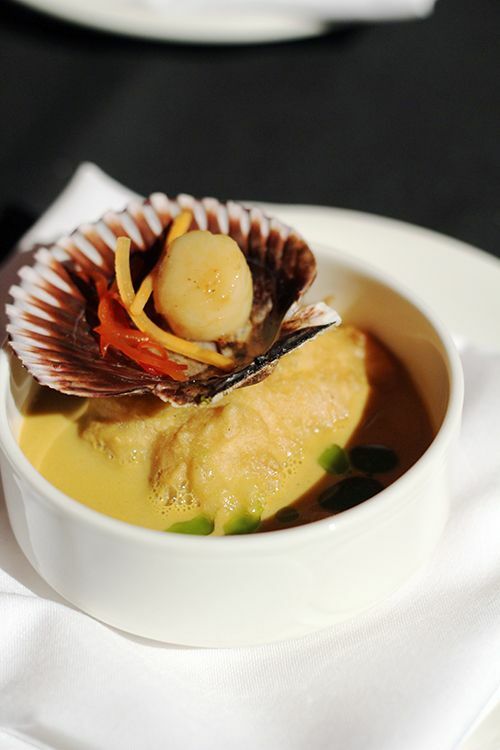 According to Chef Lalit, East Indian dishes are defined by three distinct factors: region, religion, and climate. Scroll on through to see for yourself! 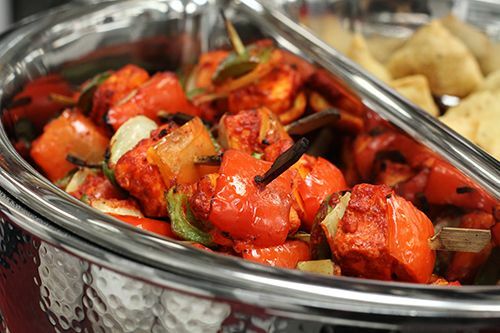 Paneer Tikka - chunks of paneer marinated in Tandoori spices and grilled. I love that paneer has a firmer texture and neutral flavour, allowing it to easily take on the flavours of marinades and sauces it is cooked in. Vegetarian Samosa - fried pastry with a savoury filling made with spiced potatoes, onions, peas & traditional spices. As typical as this will sound, I love samosas. The filling packed a flavourful punch, making it one of the most memorable bites of the evening for me. 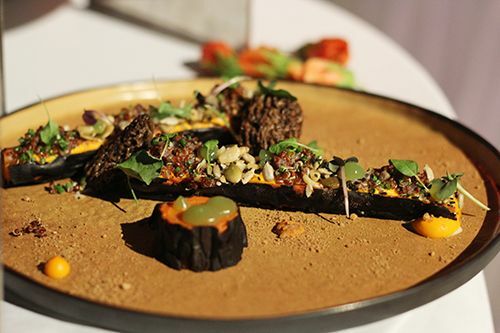 Shami Kebab - ground beef & chick pea patties marinated with fresh herbs & hot spices. Chicken Hariyali - chicken breast meat rubbed with an aromatic paste made with cilantro, mint, and other distinctive flavours. 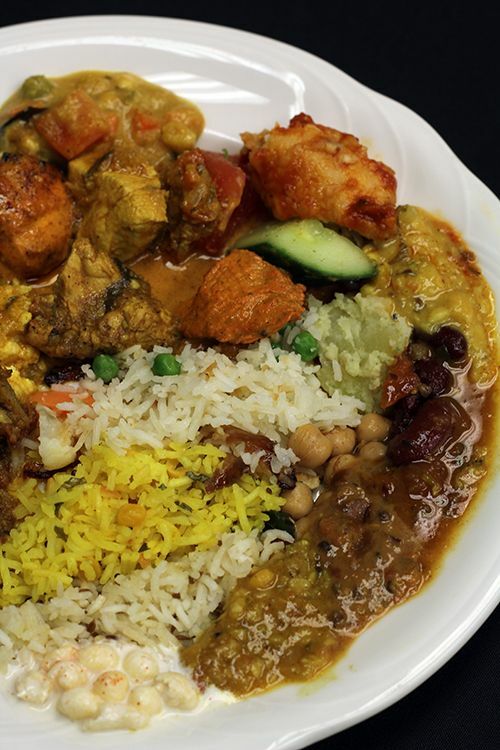 If there's one thing Indian food does well, it's pops of colour! Fish Amritsari - named after the city where it originated, batter fried fish is spiced with Indian flavours of garlic, ginger, cumin and chaat masala. Vegetable Pakora - vegetable fritters. Similar to other cultures, rice can either be prepared in various ways to complement the flavours and spices in different dishes, or it can stand alone. 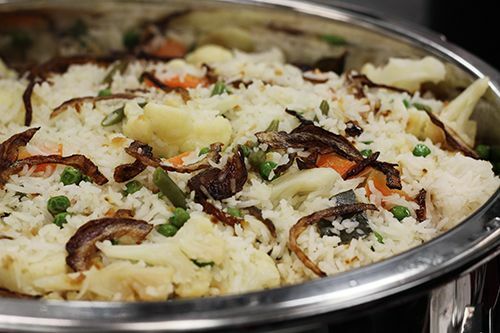 Veg Pulao (above) - spicy rice dish prepared by cooking rice with various vegetables and spices. Nimbu Chawal (below) - refreshing and tangy lemon-flavoured south Indian rice. This rice was so fragrant and I loved the hint of lemon! Goat Nariyal - braised goat meat in a coconut milk curry. Coconut milk is commonly used in south Indian cooking to neutralize the spice in a dish, whereas onions are used for the same purpose in north Indian cooking. Goat Vindaloo - a flavourful Goan inspired goat dish that is hot, sweet, sour and spicy. Chilli Fish - Indo Chinese style marinated tilapia that is batter fried then cooked in freshly made chili sauce. Contrary to the name, this dish isn't spicy, but rather takes on a sweet chili flavour. Goan Fish Curry - a fish curry that blends together spices and coconut to bring out the mild sweetness of the tender, fresh fish. Aloo Chaat - a savoury potato side dish. Basically the Indian equivalent of a potato salad! Rasmalai - Bengali dessert of soft paneer balls immersed in chilled, creamy milk. 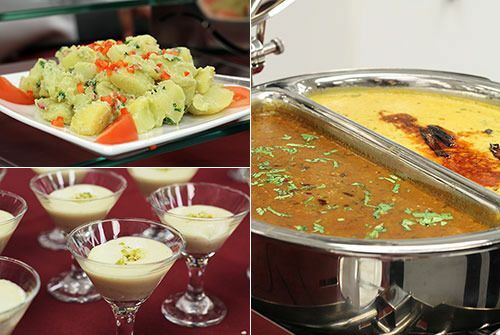 Indian meals are typically served as one course, so desserts are not usually served. 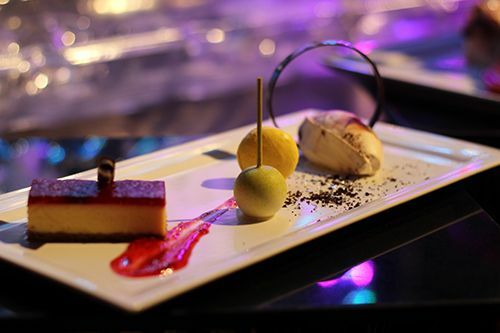 Desserts are relatively "new" to Indian meals, as sweets were usually only cooked for festivals. Rajmah Dal - a popular Indian vegetarian dish made with red kidney beans in a thick gravy. Dals (lentil curry/sauce) are a staple in Indian cuisine served alongside roti, naan, or rice. I love dals for their complexity in flavour and high protein content - they are absolutely delicious and filling! Pancharatni Dal - a classical recipe of Rajasthani cuisine. Pancharatni (meaning 5 Jewelled) dal is a mix of 5 lentils cooked with masalas to make a creamy dish. Boondi Raita - side dish made with tiny fried gram flour balls seasoned and soaked in yogurt. It's almost like having tiny fritters soaking up flavours in a bowl of yogurt. Pineapple Raita - sweet and sour raita with pineapple pieces, curd and cumin powder. 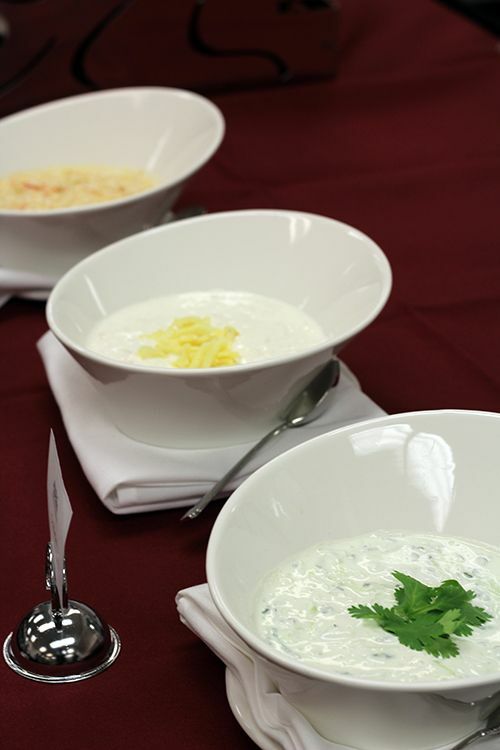 Cucumber Raita - famous Indian raita where yogurt is flavoured along with a hint of spices and cilantro. I've only listed a portion of the food we indulged in that evening, so I'm sure you can imagine just how stuffed I was by the end of the night! I managed to fit tasting portions of all the dishes on a plate and finished it all, so I would call that a win! Despite having all the dishes on my plate, it was amazing to see how different one dish was from another in terms of taste and texture. Lesson learned: not all Indian food tastes the same! If you're interested in the menu, take a peek online and host your next event with the Shaw Conference Centre. 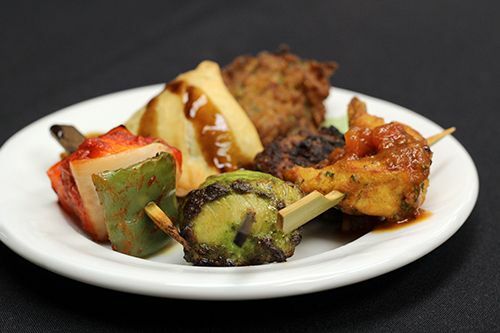 It was a fantastic evening of learning and gaining a new appreciation for East Indian cuisine, and now I just have to figure out how I can host a big enough party at the Shaw Conference Centre to enjoy the dishes off the menu again! 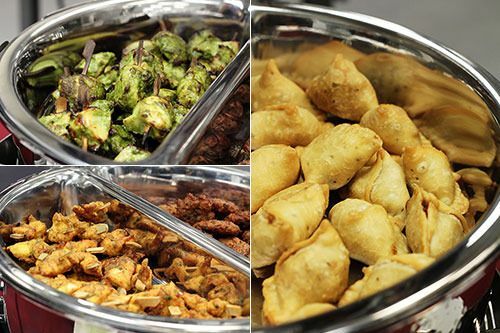 *Disclosure: I was invited to a media preview of the East Indian menu at the Shaw Conference Centre. Views expressed in this post are solely mine. This post is 100% my opinion, and as always, my priority is to you, the reader, to present an unbiased, thorough review. 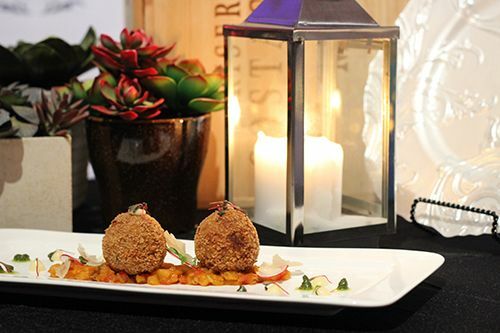 The Rocky Mountain Wine & Food Festival is back in Edmonton for the 14th year for two days of indulgence on November 6th and 7th, offering a little something for everyone. The Festival offers the opportunity to sample an extensive variety of world-class wine, scotch, premium spirits, import and micro-brewed beer along with gourmet culinary creations from local restaurants, hotels and food purveyors. At the festival you can stop by the on-site Sobeys Liquor store to purchase some of your favourite sips to enjoy at home. Make sure to enter into the grand prize draw for an all-inclusive weekend getaway for two at the beautiful Sunshine Mountain Lodge! I've attended the festival for the past three years and it is always a great experience! My favourite part is checking out what new dishes all the local restaurants have for sampling. Take a look at the list of food samples available this year - there is definitely something for everyone! The event is a lot of fun, and I want to make sure you can get in on it too. I have one pair of entrance tickets for the Saturday afternoon tasting on November 7th from 12-4PM to give away to one lucky reader! The tickets will gain you entrance to the event, but tasting for the food and wine will cost coupons, priced at 50 cents each. Please note that this event will NOT allow minors - not even if you are bringing an infant along with you. Follow the simple rules below to enter. This giveaway is open to everyone able to attend the tasting session on November 7, 2015. All entrants must be 18+ years of age. You have until October 31st to enter, and the winner will be selected by random and contacted via email. Good luck! Cream, eggs, sugar, fire. Put them together and you have your basic creamy custard-based dessert. While the base to all custards are composed of the same ingredients, the ratio in which they are combined can result in drastically different desserts. Creme Brulee is one of my favourite classic custard desserts. I prefer mine where the custard is creamy but not overly sweet and the caramelized sugar cracks away beautifully when broken. 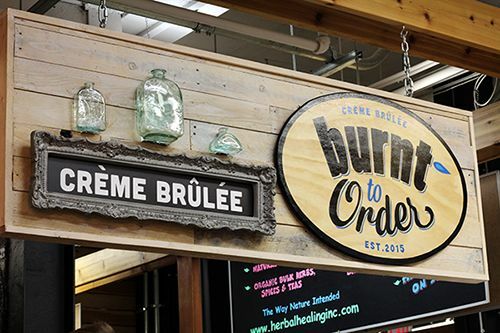 This past summer I was introduced to the specialty creme brulees crafted by Chef Jesse at Burnt To Order, and I haven't been able to eat any other creme brulee since. Burnt To Order can be found on weekends at the Crossroads Market in Calgary. The menu serves up granola and breakfast brulees, but I'm mostly interested in the specialty creme brulees. Burnt to Order offers 4 core flavours on their creme brulee menu that change every season, and each weekend there is a special feature as well. The creme brulees are gluten free and there's even a vegan option available, meaning there's a dessert here for everyone. Although the flavours of each brulee are different, the custard base is just about the same. The creme brulees are smooth, creamy, and it is literally impossible to have just one bite. At $8.50 each, or 3 for $24, the prices are incredibly reasonable for the quality of dessert that you receive. During the summer time the Bean & Basil was, unexpectedly, the flavour combination I fell in love with. 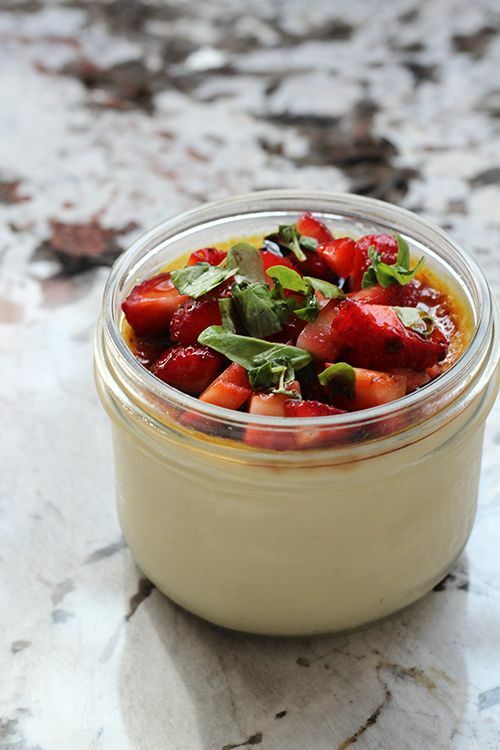 A vanilla bean creme is bruleed and topped with fresh strawberries, microbasil, and a drizzle of 10 year aged balsamic vinegar. 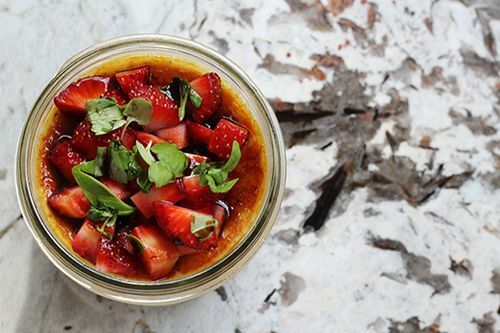 The strawberry and basil combine well, and the balsamic adds a tart component that cuts through the rich custard base. Another favourite from the summer was the Cracker Jacked (also on the fall menu! 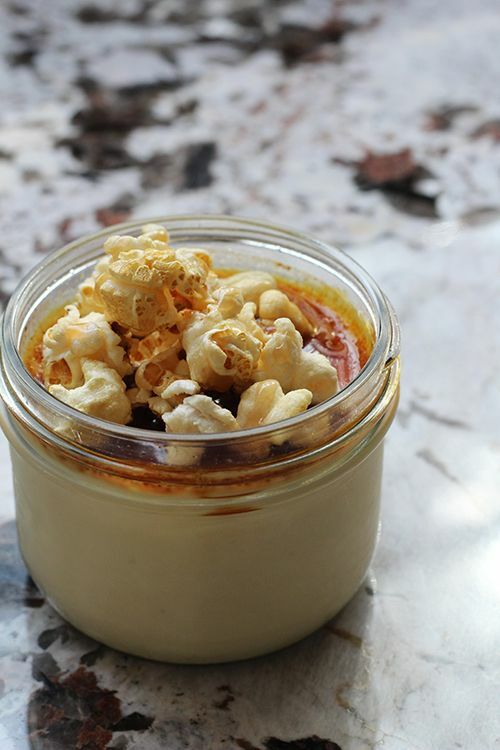 ), which featured a popcorn infused vanilla custard topped with salted caramel sauce and kettle corn from Sugar Creek. I'm a huge sucker for freshly made kettle corn, and the sweet and salty balance in this creme was delightful. 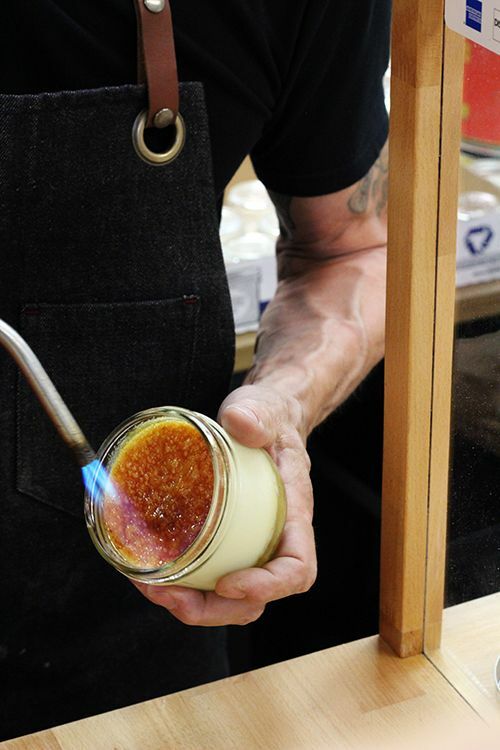 Burnt To Order utilizes local and exotic ingredients and is environmentally conscious by serving the creme brulees in reusable Mason jars. The flavour combinations range from classic to contemporary. and many are innovative flavours I would never think to pair with a classic creme brulee. 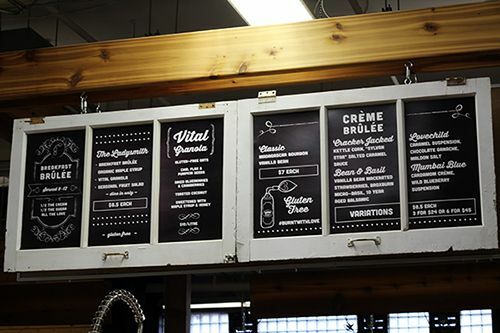 I've loved all the flavours I've tried so far, and every trip to Calgary now includes a stop at Crossroads Market to pick up a couple creme brulees to enjoy when we are back home in Edmonton. As long as you let the "char-ista" know that you're bringing the brulees elsewhere, the toppings are packaged separately and everything transports incredibly well for later enjoyment. The fall menu is now featuring an apple pie creme that is totally calling my name. With fall spiced Golden Delicious apples paired with salted caramel custard, it sounds like I need to make a trip down to Calgary. Stop by the market Friday-Sunday each week and get yourself some creme! 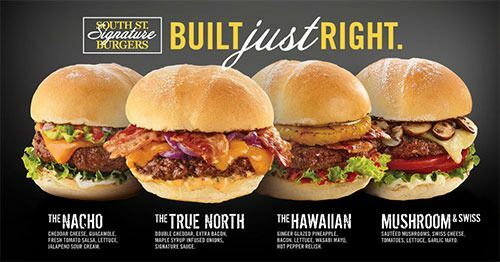 After The Burger's Priest showed up in Edmonton, another Canadian-based burger franchise has made it into our city! 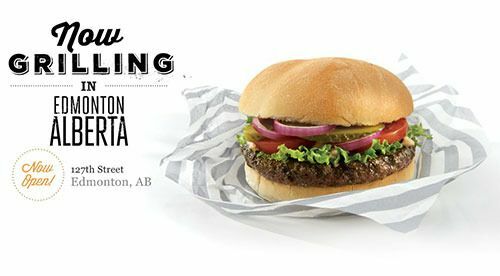 Located in the north end of Edmonton in the Oxford area, South Street Burger Co. is here to share their burgers with us beef-loving Albertans. South Street Burger Co. is owned by the popular french fry chain New York Fries. As fries are the best accompaniment to burgers, it makes sense that the company moved into this direction. All South St. locations are set in a contemporary, New York style loft-like environment, and the Edmonton location seats 45 and has additional seating on the patio in the summer time. 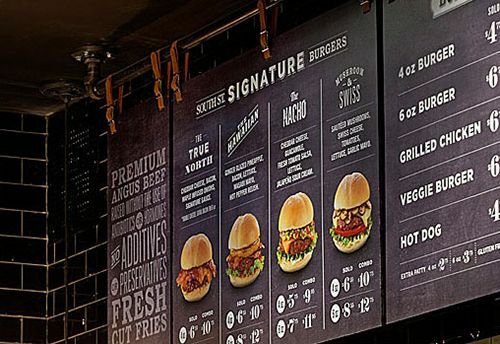 South St. Burger's menu features 4 oz. and 6 oz. patties made from 100% angus beef that is raised without hormones or antibiotics. Aside from beef patties, chicken breasts, veggie patties, and hot dogs are available too. Four signature burgers are available to choose from (see above), or you can even customize a burger the way you like it with gluten free and vegan options available. To accompany the burgers, all locations feature the same fries you get at any New York Fries location. Milkshakes and ice cream can satiate your sweet tooth, so there's a little something for everyone on the menu. Want to give South St. Burger Co. a try? Check out the details below! $20 to spend at South St. Burger Co. Mandatory Entry: To enter, tell me which signature burger you would order at South St. Burger Co. Please make sure you leave a valid email address in the giveaway widget as this is how I will be contacting you. This giveaway is open to anyone 18+ years of age. You have until October 26 to enter and the winner will be selected by random and be contacted via email. Good luck! *Images in this post thanks to South St. Burger Co.
Over the last few months one thing about Edmonton has become clear: the people in this city are hungry for a good bowl of ramen. 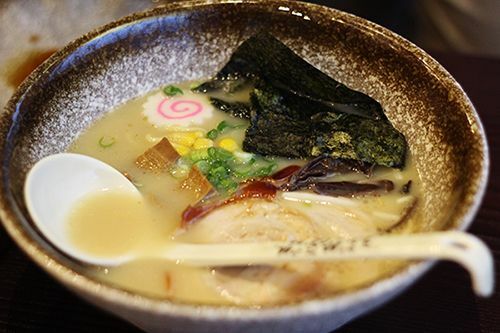 While the opening of Prairie Noodle Shop's highly anticipated storefront is still months away, there's a new contender offering up steaming bowls of this Japanese comfort food in the west end of Edmonton. I had the opportunity to attend Kazoku's soft opening last week to get a sneak preview of the new restaurant space. Kazoku is the Japanese word for 'family,' and the team behind this new restaurant strives to serve only food that they would be proud to serve to their own families. 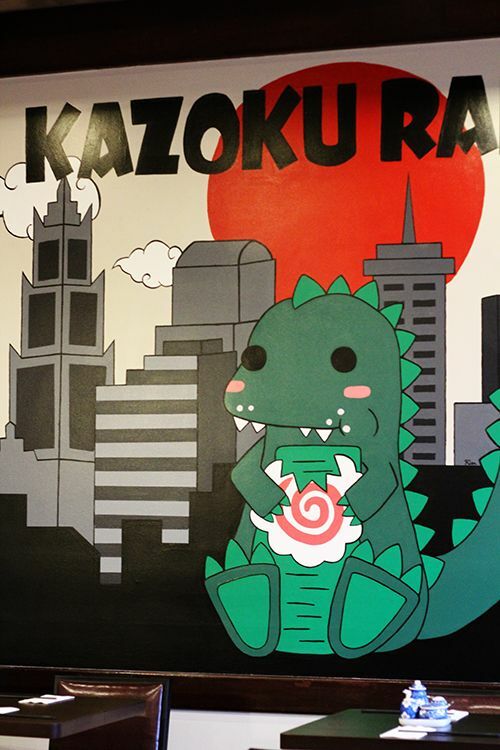 When you step into the restaurant you're greeted by Kazoku's very own Godzilla munching on a monster sized narutomaki. This Godzilla isn't just a cute face, he's the mascot behind the giant Godzilla ramen bowl! The menu at Kazoku is fairly focused, offering a couple appetizer plates and a variety of ramen bowls and rice bowls. The menu at Kazoku also features a variety of housemade sodas to enjoy with your meal. 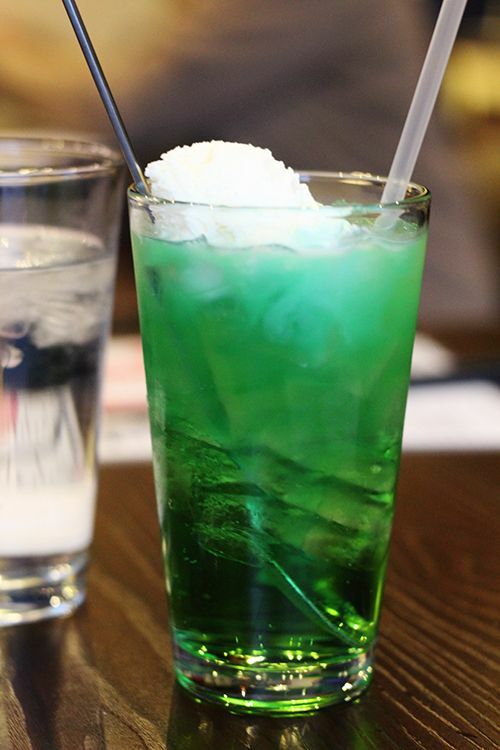 The Japanese Cream Soda ($5) caught my eye, and I was surprised to see that the soda itself was bright green in colour. You could definitely tell that the honeydew flavour was artificial, but it mimicked the true flavour fairly well. The ice cream gave the drink a nice hint of vanilla flavour and creaminess, so if you're a honeydew lover, this one is for you! Our table decided to start out with a couple appetizers, trying three of the six available plates. 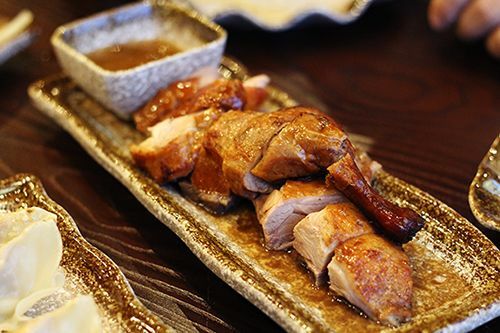 The BBQ duck ($10) is roasted Chinese style in house daily and served with a side of plum sauce. The marinade for the duck was fairly typical of the ones you can pick up from any Chinese BBQ shop, but I found the meat to be quite moist and flavourful. Next we had the pork Gyoza ($7) served as a set of 6. The dumplings were pan fried to a lightly golden crisp, keeping the meat inside juicy and flavourful. While these gyoza were pretty standard, I quite enjoyed the ponzu style dipping sauce as it was both sweet and savoury with a kick of heat. Last but not least we had to try the Beef Tataki ($11). 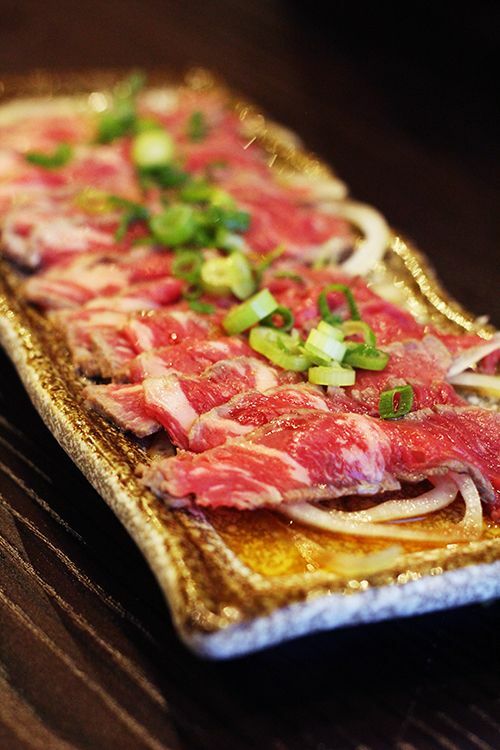 Kazoku's version had beautifully marbled striploin that was tender and sweet, dressed with onions, scallions, and a light but flavourful ponzu sauce. The slices were a fair thickness, and the portion size quite reasonable for the price. Next came the part we had all been waiting for: hot, steaming bowls of ramen. 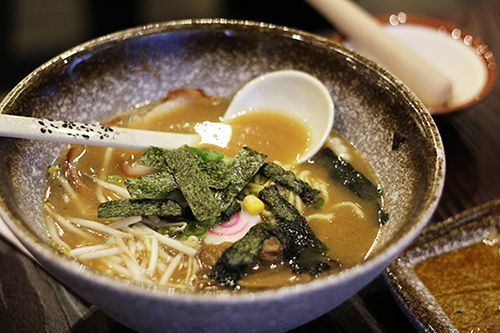 The menu offers five different options, which include the Kazoku ramen, tonkotsu ramen, miso ramen, shoyu ramen, and shio ramen. The toppings in each bowl are quite similar, so the bowls mostly differ in their soup bases.The first bowl to arrive was the Tonkotsu ramen ($14) topped with slices of char siu, a half soft-boiled egg, nori, bamboo shoots, corn, bean sprouts, toasted sesame, green onion, and narutomaki. The soup was slightly thick and creamy, the way most tonkotsu broths should be. I felt the broth could have used a tiny bit more seasoning, but otherwise it was tasty. While the broth is made in-house, the wavy noodles are flown in from a manufacturer in Vancouver. The noodles aren't too thick or thin, and once cooked have a dense, slightly chewy texture. While they hold their shape well while you enjoy the bowl, they don't quite have the elastic bite that I prefer. We also got an order of the Miso ramen ($13), which featured the same toppings as the tonkotsu, except with shredded nori. The miso ramen featured the most flavourful broth of all the bowls at our table that evening, and you could taste the subtle nutty flavours in the broth. The char siu in these ramen bowls is equal parts lean and fatty, lending extra flavour to the noodles. The soft boiled eggs are cooked to the perfect consistency with a slight oozing yolk, but they would be made even better with a marinade. For myself I had to order the Kazoku ramen ($15), which features char siu, a full soft-boiled egg, nori, bamboo shoots, corn, wood-ear fungus, bean sprouts, toasted sesame, green onion, and narutomaki. Basically, all the toppings that Kazoku uses in their ramen bowls. 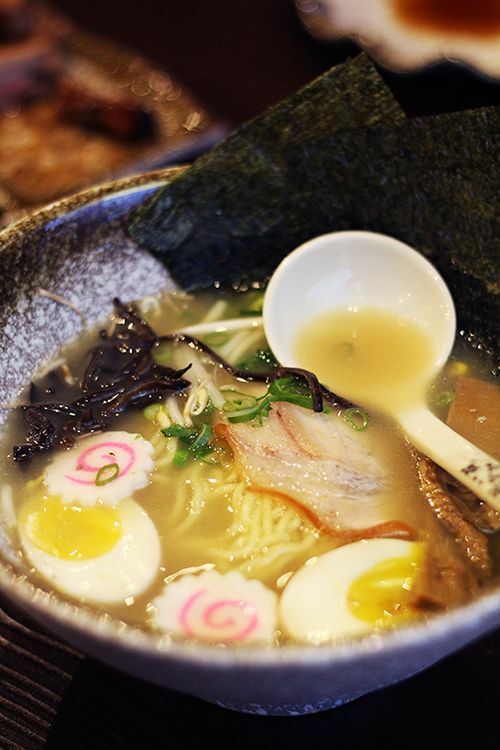 This ramen sets itself apart from the rest by its clear pork and chicken based broth. It's the lightest broth the restaurant makes, and it has very subtle flavour to it. I wasn't expecting this upon ordering, and initially found the broth to be quite bland and underseasoned. If you're looking for a broth that isn't too heavy, this may be for you, but I like my noodle soups to be packed with umami, and this bowl unfortunately didn't do it for me. Since Kazoku also offers rice bowls, we needed to try one out for ourselves. Bowls can be topped with BBQ pork, BBQ duck, imperial chicken, or soya chicken, but we chose to get a combination of the BBQ pork and imperial chicken with the 'pick two' option ($14). 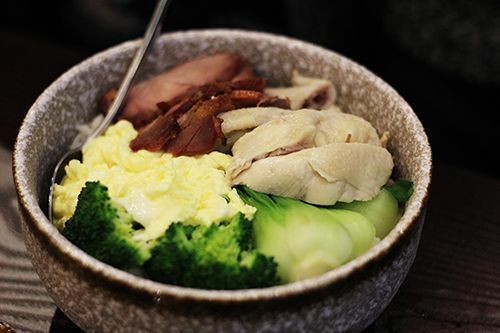 The large bowl of rice came to the table with a generous portion of pork and chicken, and sides of a soft omelette, broccoli, and bok choy. The rice bowl came as described, but it was quite boring compared to a big bowl of ramen with a variety of toppings. As rice bowls are fairly easy to put together, I would recommend skipping them all together and ordering a bowl of ramen instead. 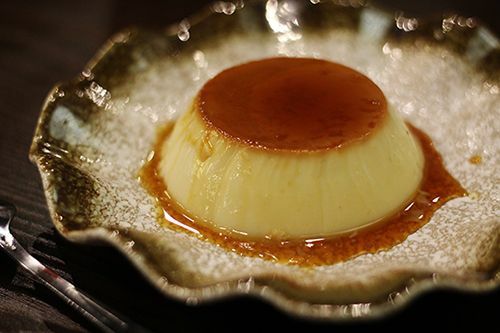 To finish off the meal that evening I chose to try the Purin ($4.50), which is the Japanese version of a creme caramel or flan. I'm a sucker for custards, and this one didn't disappoint with it's smooth, creamy texture. The purin wasn't overly heavy or sweet, making it a perfect end to the meal for me. 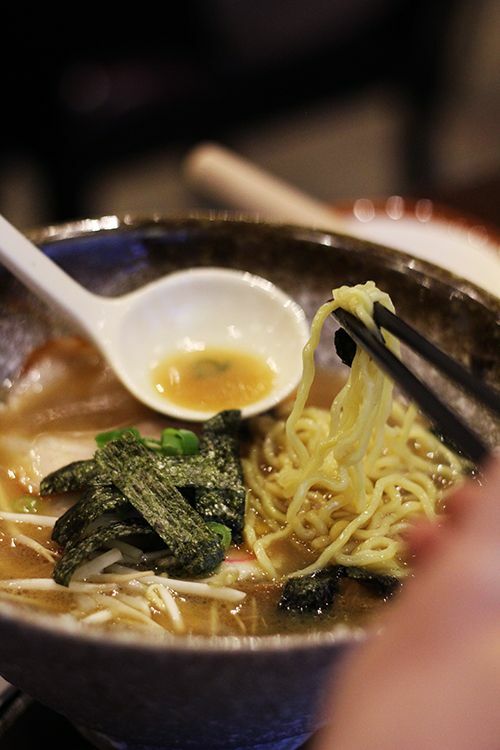 The ramen scene in Edmonton is continuing to grow and it's great to finally have an option in the west side of the city for a bowl of this Japanese comfort food. While the noodles at Kazoku aren't what I prefer, the tonkotsu and miso ramen broths lack some depth but have good flavour, making them on par with other bowls in the city. As mentioned above, Kazoku will be featuring a Godzilla ramen bowl, where you can have it for free if you finish it! And to show off your amazing eating capabilities, you get a t-shirt featuring Kazoku's Godzilla on it too. 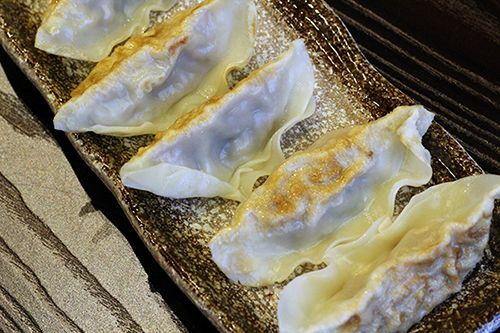 The prices are affordable and on par with other Japanese restaurants, so stop by if you're nearby. Kazoku Ramen was receptive to feedback, and the bowls may change a bit. The restaurant officially opens today (October 15th) to the public, so grab a bowl and let me know what you think! *Disclosure: Kazoku Ramen invited me as a guest to attend their soft opening. Views expressed in this post are solely mine. I was not expected to feature this restaurant on my blog, nor obligated to do so. This post is 100% my opinion, and as always, my priority is to you, the reader, to present an unbiased, thorough review. I've said it once, and I'll say it again: good Malaysian food is hard to find in Edmonton. Just recently a new Malaysian spot opened up, and I just had to stop by. 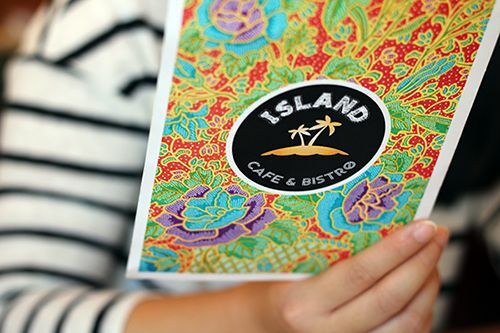 Island Cafe & Bistro opened up just over two months ago in the west end of Edmonton on the ever-busy 170th Street. It's easy to drive by without noticing it, but it seems like that isn't an issue for this restaurant, as the space was just about full at 5:30PM on a weeknight. This cafe declares itself to be a place "where the taste of the east meets west," having a menu featuring traditional Malaysian dishes and other plates to suit the Western palate. 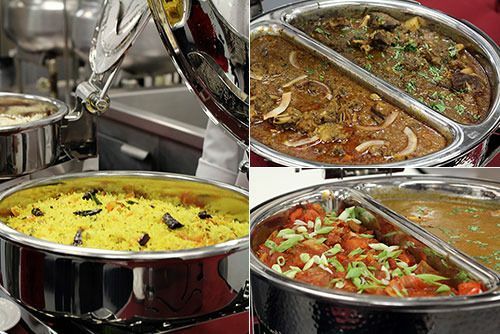 The menu offers a decent number of Malaysian dishes, and we chose to go with our favourites. Roti Canai with Curry Sauce ($3.95/2) is something I cannot go without when it comes to Malaysian food. 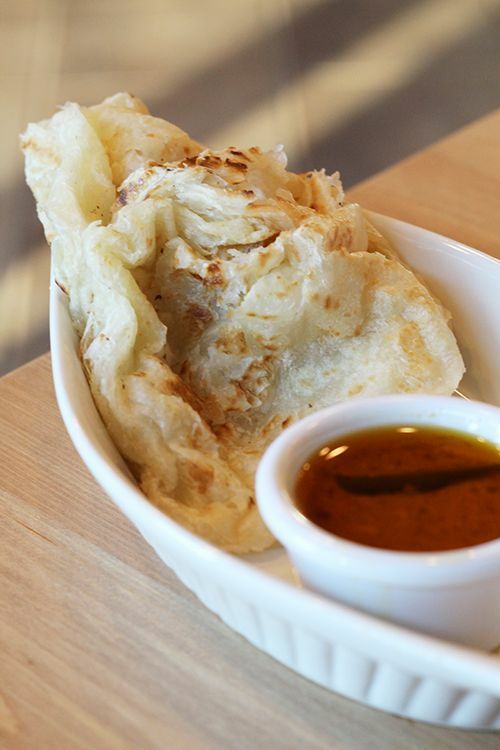 A crisp exterior and fluffy, pliable layers is what this roti is known for, and the version here does not disappoint. Crunchy and chewy textures contrasted one another, and the wonderful buttery flavour definitely came through. The side of curry sauce was unfortunately coated in a heavy layer of oil, and needed a quick stir in order for the flavour to come through with each dip. 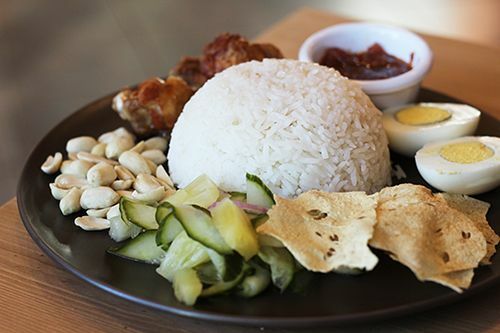 Our next dish was the Malaysian Style Nasi Lemak ($12), which featured steamed coconut rice, spicy sambal sauce, 3 chicken wings, a hard boiled egg, peanuts, pickled cucumbers and pineapples, and papadum-style prawn crackers. Everything mixed together resulted in a dish with a pleasant heat, slight sweetness, tang from the pickles and a wide range of textures from all the components. However, given the price tag and the ingredients on the plate, we felt the dish would benefit from having a bit more chicken as the wings were quite small. 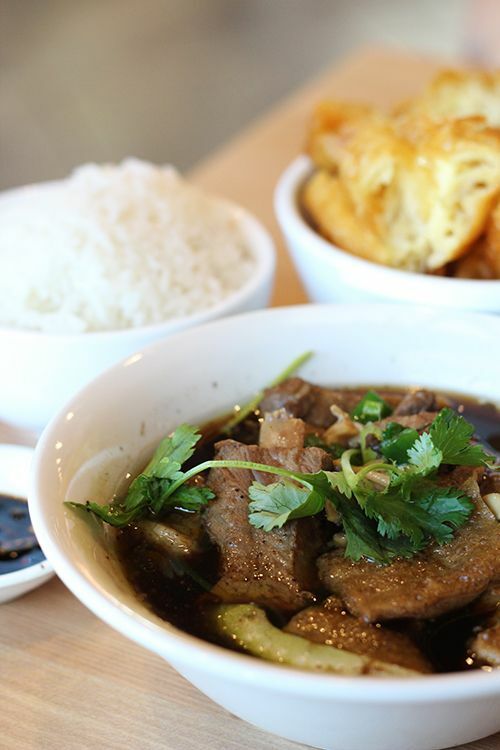 Bak Kut Teh, which literally translates to meat bone tea, is a dish consisting of pork ribs braised for hours in a broth of Asian herbs and spices. Ironically enough, the dish itself doesn't contain any tea at all, but rather tea is typically served alongside this stew with the belief that it aids in digesting the fat in this dish. The version here at this restaurant ($15) features pork ribs, pork belly, mushrooms and vegetables in the herbal soup, served with a side of rice and Chinese long donuts. The pork in this is stewed until fall-apart tender, and the herbs used in the broth were fragrant, but the soup was watered down and lacking seasoning. Had the flavours been more prominent it would have been great. The last dish to our table was the one I was most looking forward to having - Laksa Curry Noodles ($12). This dish is pretty iconic when it comes to Malaysian cuisine, featuring vermicelli in a curry-based soup. 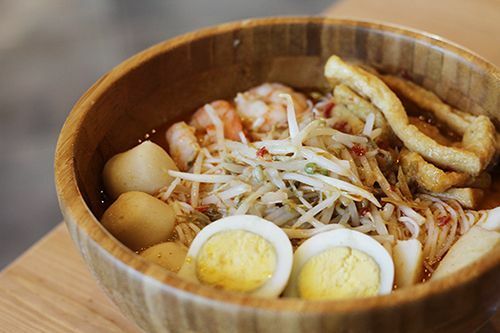 The Laksa at Island Cafe features thin vermicelli with fried tofu, fish cake, shrimp, fishballs, a hard boiled egg, and bean sprouts in a spicy coconut soup. The toppings were abundant and the vermicelli al dente, but like the bak kut teh, the broth was lacking a depth of flavour and felt watered down. The broth was missing the creamy consistency and thickness to coat the noodles that I expected. With some improvements in the broth, this could also be a well done bowl of laksa. When I walked into the cafe that evening my eyes immediately drifted to the dessert case, which contained a couple of classic French mille crepe cakes. 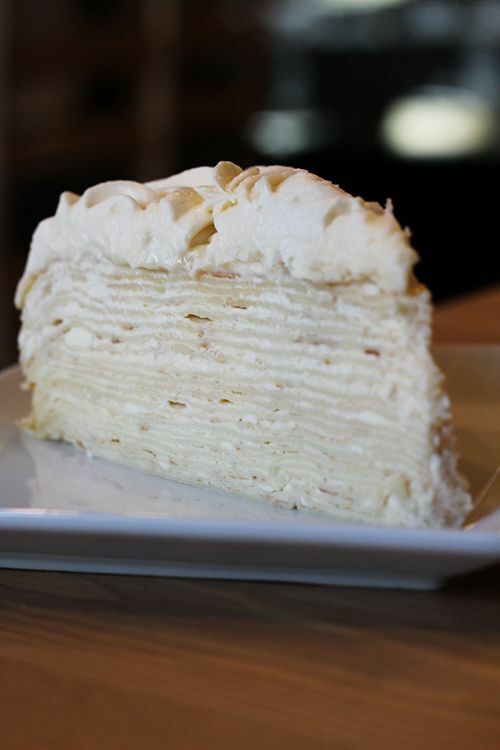 Mille, translated to 'thousand' in the French language, implies that this cake is made with multiple layers of crepes separated by light pastry cream. To my knowledge, Island Cafe is the only spot in Edmonton to serve this dessert, so I was absolutely excited to try their housemade version. At $7 per slice, the cake is available in a multitude of flavours, including classics like vanilla and maple walnut, and exciting flavours like pandan kaya coconut, dark chocolate banana cream, and creme brulee cheesecake. Flavours can change daily, and you can even order a whole cake to wow guests at your next dinner party (7" for $60 / 10" for $80). Considering that it takes 2 days to make one full cake, the $7 per piece price point is very reasonable for this labour-intensive dessert. We ordered one slice of the mango creme flavour and one of the creme brulee cheesecake flavour, with a white coffee ($3) on the side. It was hard to detect the delicate creme brulee with the cream cheese being the predominant flavour in the creme brulee cheesecake mille crepe cake, but the fragrant mango really came through in our other slice. The layers are soft and you can really appreciate the effort that go into producing the cake. I'd definitely give the pandan kaya coconut a try on my next visit! I love when small, family-run restaurants pop up in the Edmonton food scene, and it's even better when they serve food that isn't commonly found in our city. I can appreciate that everything in the restaurant is made from scratch, and the restaurant is open until 11PM for late night eats Tuesday through Sunday. While some dishes require some adjustments, the food is decent and I'm hoping the Malaysian classics will improve by the time I make my next visit. 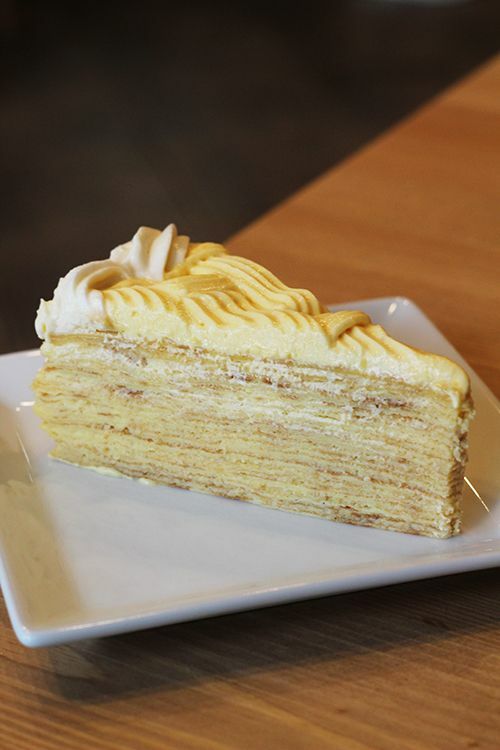 That roti canai is already calling my name, and I can't wait to get my hands on another slice of mille crepe cake! 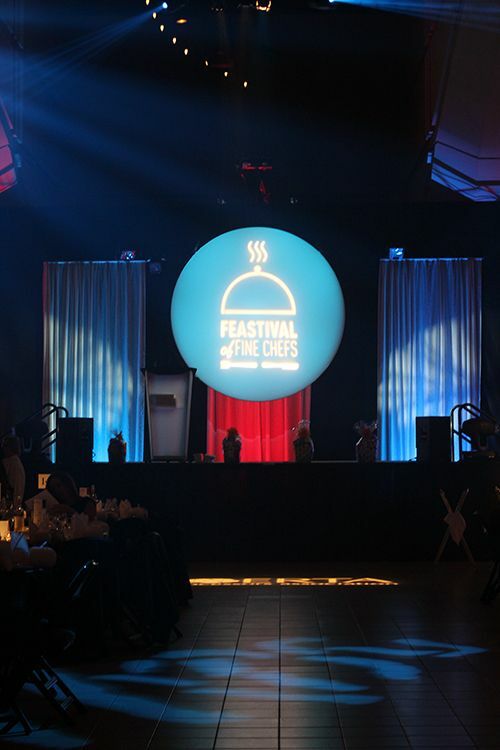 Every Fall, an assortment of Edmonton's restaurants come together to create a one of a kind gourmet dining experience at the FEASTival of Fine Chefs. FEASTival has been organized by the Alberta Food Processors Association (AFPA) for the past 27 years, and I was lucky enough to attend as guest of the organization this year amongst other local bloggers. The AFPA is a non-profit organization that has members representing all sectors of the food and beverage industry. 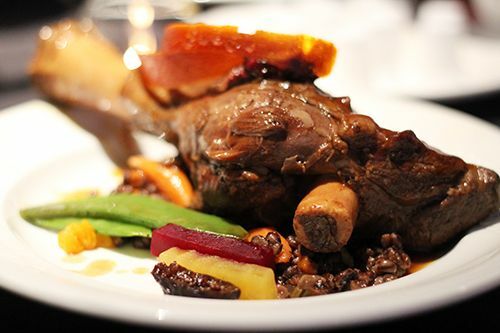 From food growers to processors to retailers, the AFPA hosts the annual FEASTival of Fine Chefs at the Shaw Conference Centre and showcases the culinary talents of chefs around the city. 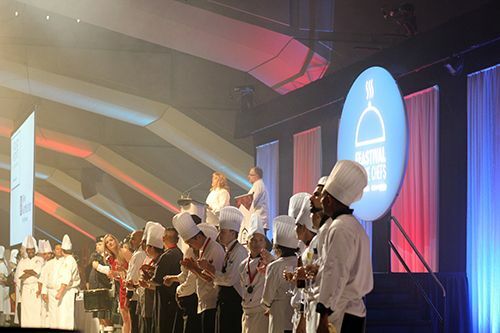 FEASTival is not only a gourmet culinary experience, it's a night that apprentice chefs get the chance to show off their culinary skills and meet others in the industry too. Tickets to the annual event are $125, which includes wine and a four course meal prepared with ingredients grown or processed in Alberta. 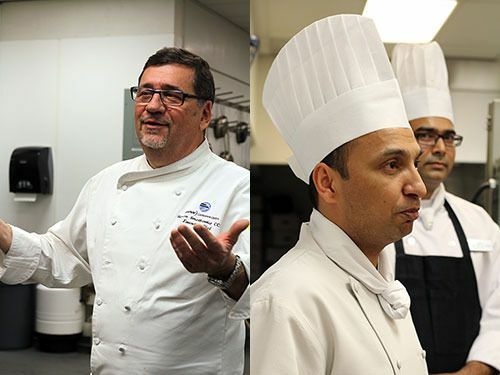 A silent auction also runs for the evening and proceeds go towards the Stan Ballard Endowment Fund, which provides scholarships and funding for apprentice chefs at post-secondary institutions like NAIT and SAIT. 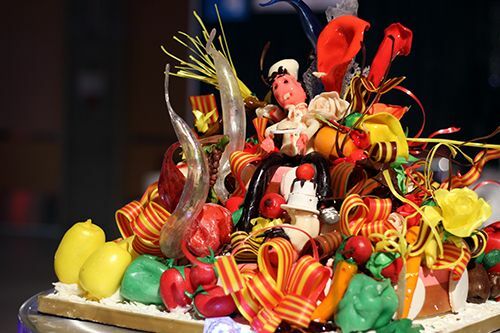 This food extravaganza is unlike any other - it's almost like a scavenger hunt of sorts! 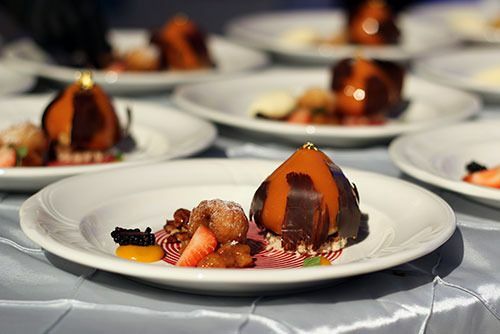 While most dining events feature seated service with plated meals, FEASTival throws all certainty out the window and you have to search for your courses throughout the evening. When you arrive, you're given a number which designates where you will be getting your courses for the night. For me, that was #21. Once you enter the hall, you can peruse the restaurants/organizations to find out where your night will begin. As each course changes throughout the evening, so does the number corresponding to the restaurant/organization. The change is completely random, so you can't even predict where you'll go next. With this dining format, all four of your courses will be served from different restaurants, so there's an element of surprise and excitement! The excitement isn't just for the attendees though, the chefs are notified of the proteins they will be using just days before, and they receive a box of mystery ingredients to use 24 hours prior to the event. 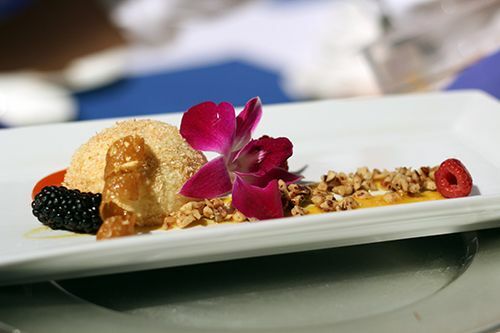 The chefs are encouraged to be creative and have fun with what they are given. After a quick walk around the hall for hors d'oeuvres and checking out the amazing displays, my ticket brought me to Zinc Restaurant for my appetizer course. 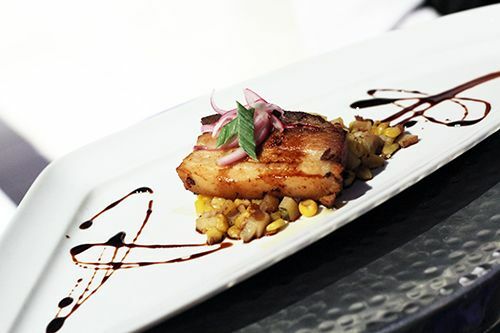 Chef Dave Omar put together a dish of roasted pork belly with a corn and potato hash. A pomegranate molasses jus, pickled red onions and scallions rounded off the dish, making it a solid start to the evening. One of the great things about eating with a table of friends is being able to taste a variety of plates for the evening. As each one of us returned to our table from retrieving our plates, we inevitably ended up passing around the ones we were most interested in sharing. Lucky for us Chef Chris Short, FEASTival Committee Chair, was dining with us for the evening and snagged a couple extra plates for us. Like I always say, sharing is caring! My soup for the night came from the Executive Royal Hotel, and it was the most beautiful soup at our table. The chefs put together a five onion bisque served with a tempura battered oyster, a pan seared scallop, and was finished with a drizzle of chive oil. While the bisque was creamy and flavourful, I was disappointed to see that the soup didn't adhere to the theme of local ingredients. Scallops and oysters are nowhere to be found in the prairies, unless you think of prairie oysters *winkwink*. 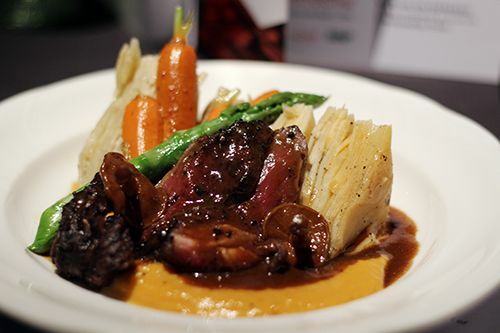 For the entree round, Stages Kitchen & Bar of the Double Tree Hotel was my destination. 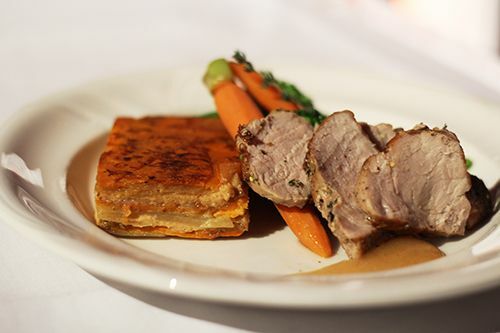 On my plate was a thyme and grainy mustard smoked pork loin with a sweet potato and rutabaga pave, spiced apple fluid gel and local vegetables. The pork was seasoned well and the pairing with the apple was delicious. However, the pork loin was incredibly dry and difficult to eat. Given that the food is prepared in advance, it can be very difficult for some of these organizations to cook proteins perfectly, and pork is one of those proteins that dries out quickly after cooking. It was unfortunate, but lucky for me, there were other entrees at the table that I happily dug into! My last dish of the evening was a beautifully plated dessert from the Shaw Conference Centre. 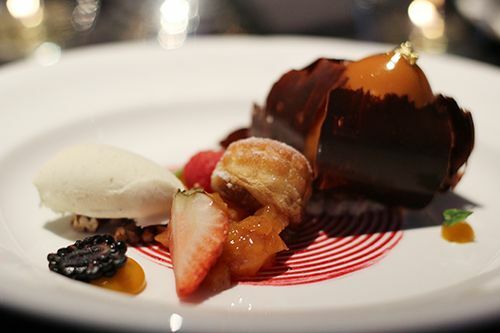 The dessert consisted of a caramelized white chocolate hazelnut mousse served with a hazelnut financier, sour cherry gel, bourbon ice cream, and a caramel brioche beignet. The gel-like consistency of the caramel around the mousse was a welcome surprise, and I absolutely loved the ice cream. It was delightful in presentation and flavour! For my first FEASTival experience, I had a great night! I really enjoyed the element of surprise throughout the evening and it was great to catch up with some other local bloggers. Although some dishes can be hit or miss, it's really fun to hunt for your food and share with others at your table. Given the price tag to this event, it can be on the more expensive side, but you are also supporting local food and up and coming chefs! It is a fun night out where you get to dress up and try a variety of different foods. It really is a one-of-a-kind event, and I hope to see you there next year! Big thanks to the AFPA for the invitation and being great hosts! *Disclosure: I attended FEASTival as a guest of the Alberta Food Processors Association. Views expressed in this post are solely mine. This post is 100% my opinion, and as always, my priority is to you, the reader, to present an unbiased, thorough review.